Feel like having an adventure vacation on skis ? Want to cruise down the slopes of different mountain ranges, on different continents? If you want to know what to expect, myself (Chris) with Aggie, will give you our perspective. We have visited a lot of these destinations, and are actively seeking out new ski adventures. If you are contemplating an adventure vacation skiing, or snowboarding, cannot resist the lure of white powder, pristine mountainous terrain, join us for this journey. What is wonderful is that different skiable regions have different ambiance, feel, character and generally offer a different vibe. Not many ski destinations are the same. European ski resorts offer a different cultural aspect, historical perspective which is difficult to match in younger countries. On the other hand the grandeour of Alaska, or Andes cannot be eclipsed by gentler skiable mountains. Skiing next to Fjords, lakes, down the glaciers, across two mountain ranges in a day, can only be the beginning of your adventure vacation on skis. Resorts being not older than 40 years have experienced phenomenal growth. Beautifully crafted villages, chalets complimenting each other in architecture, having a great alpine feel, great lift systems, and great service. Whistler-Blackcoombe prides itself as having the highest vertical drop in the country.To check out our trip to Whistler-Blackcoombe follow us here. 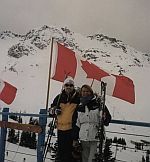 Adventure Vacation on Skis in Rocky Mountains of USA. The mountainous ranges tower to altitudes of 4300m.The ski resorts are well organized, well groomed, and offer good powder. For those of you who have the need for lots of powder, the state of Utah earned it’s reputation for being the powder capital of the world. The scope of ski destinations on the platter is abundant. For our adventure vacation on skis in USA, follow us here. Adventure Vacation on Skis in Southern Americas. When it comes to skiing adventures at this part of the world, expect more of a spiritual experience. Embrace the solitude, the mountains have to offer. The grandeur of the mountains is overwhelming. El Plomo Peak 5430m above the sea level, Cerro General Manuel Belgrano peak 6250m above sea level, only to name a couple. Most of the ski resorts are above 2250m , hence offer good snow cover in the winter season. Lifts up to 5500m above sea level will add to your sense of a ski adventure. Adventure Vacation on Skis in Europe. This part of the world offers you a cultural, and a historical perspective that is not easily matched by younger countries. The mountaineering alpine feel, dating to when dukes and empires roamed the mountains, few hundred years ago . Old, mountain herdsman’s settlements, like shown in the picture, can be found here. Chalets, which were build prior to the invention of a car, are abundant here. Soak up the vibe each country has to offer. Scenery throughout different regions is also breathtaking.Follow us here to get our perspective of skiing Europe. Explore the vast expanse of all the ski regions, on two islands with abundance of powder. Japan offers over 600 ski areas. Read our overview of the region. Adventure Vacation on Skis in Australia and New Zealand. These places offer you an excellent ski destination alternative when you want to chase the white powder around the world. The great dividing mountain range, in Australia, is geologically ,hence visually very different to other skiable regions of the world. Your skiing experience will be memorable. The fauna and flora of this continent covered in snow will give you a unique feel. New Zealand’s best adventure on skis, I feel, will await you around Queenstown, where beautiful scenery of lakes, and mountains is very pleasing to the eye. To read what we experienced, see Australian and New Zealand ski regions here. From adventures on skis back home.